The purpose of this special issue is to investigate the rise of eSports. Much has happened in the area of professional gaming since the Space Invaders Championship of 1980. 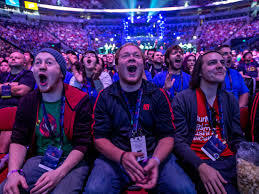 We have seen live Internet streaming eclipse televised eSports events, such as on the American show Starcade. How should game user research examine the emergence of eSports? Should we differentiate pragmatic and hedonic aspects of the game? What are the methodologies for conducting research on eSports? What is the role of player, the audience, the developer, the venue? Case studies, worked examples, empirical and phenomenological, application of psychological and humanist approaches? Potential authors are encouraged to contact Brock R. Dubbels (Dubbels@mcmaster.ca) to ask about the appropriateness of their topic. Deadline for Submission July 2016. Manuscripts should be submitted in APA format. They will typically be 5000-8000 words in length. Mission – IJGCMS is a peer-reviewed, international journal devoted to the theoretical and empirical understanding of electronic games and computer-mediated simulations. IJGCMS publishes research articles, theoretical critiques, and book reviews related to the development and evaluation of games and computer-mediated simulations. One main goal of this peer-reviewed, international journal is to promote a deep conceptual and empirical understanding of the roles of electronic games and computer-mediated simulations across multiple disciplines. A second goal is to help build a significant bridge between research and practice on electronic gaming and simulations, supporting the work of researchers, practitioners, and policymakers.